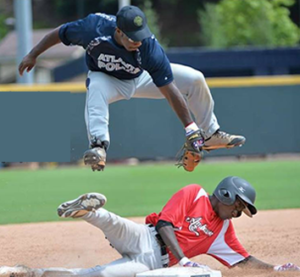 Now in its 5th year, the annual Safe At Home Game brings together Atlanta’s inner city high school baseball players with members of the Atlanta Police Department for a 7-inning, self-officiated baseball game. The purpose? Create an environment of competition, trust and respect between two communities who often struggle to find common ground and to open lines of communication so often searching for a connection. The divide between our Black community and our police officers has never been wider. Despite the serious issues of crime and law enforcement , these issues do not define our communities. The Safe At Home Game was founded in 2014 through discussions between Brad Jubin, co-founder and Executive Director of APIVEO, an organization offering leadership training to coaches and youth leaders and C.J. Stewart, former professional baseball player and co-founder and CEO of L.E.A.D., a now 11-year old organization focused on empowering an at-risk generation to lead and transform their City. Incorporating baseball as their nexus, L.E.A.D. seeks to inspire and equip young Black males with the empowerment they need to live a life of significance. Kids participating in this program are referred to as L.E.A.D. Ambassadors. 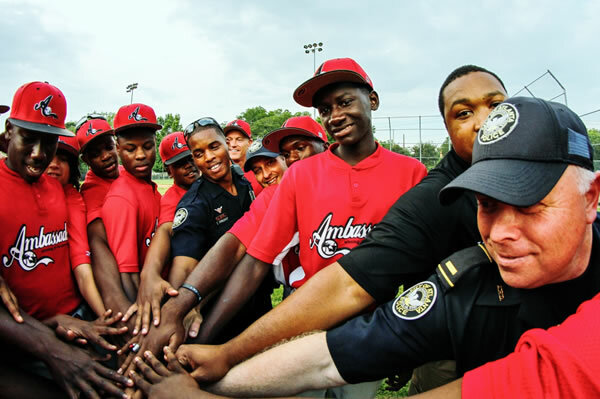 What if our inner-city kids played a self-officiate baseball game against the police officers that patrol their communities? What if we showcase the great people that live in and serve in our communities. What if we put the spotlight on the solid, caring and good people that truly make up our inner-city communities instead of the few examples that seem to get all of the media attention? What if everyone watched our kids and cops respect each other? The Safe At Home Game is now an annual event for the community. But it’s proven to be more than “just” a game. As Brad and C.J. envisioned, this has served to open lines of communication, which fosters mutual understanding and individual bonds between the kids and the cops on AND off the field. ”Words cannot express the joy I had in playing in this year’s police vs youth game. I am one of those officers who patrol through a few of the lower income, inner-city neighborhoods. On a daily basis kids and adults yell vulgar language just at the mere presence of a police vehicle, and I can honestly say a lot of times it bothers me. 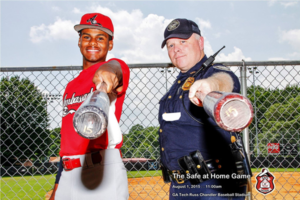 We have been hard at work to expand awareness of the Safe At Home Game to increase community and media involvement and to further establish this event as an important venue for improving relations between the City of Atlanta Police Department and the communities it serves. We believe the Atlanta Safe At Home Game could serve as a model for other cities around the country. We hope someday to reach out to groups in other locales and help them establish a Safe At Home Game event that will provide a solution for their city as it is doing today for us in Atlanta. Beginning with our first Safe At Home Game in 2015, we have been largely self-funded through a few very generous donations, primarily from individuals connected with APIVEO and L.E.A.D. as well as the Atlanta Police Foundation. However, costs for stadium rental, promotional materials (posters, t-shirts, etc.) and transportation have all substantially increased since then. And, with our current goal of strengthening our ties in the Atlanta community and developing outreach programs targeted to cities across the U.S., we are seeking to expand our abilities through corporate and individual sponsors which will allow us to reach our goal and do so much more! We need you! Please consider joining our efforts to promote much needed positive dialogue, understanding and mutual respect between our at-risk youth and the police officers who work hard every day to keep our communities safe.